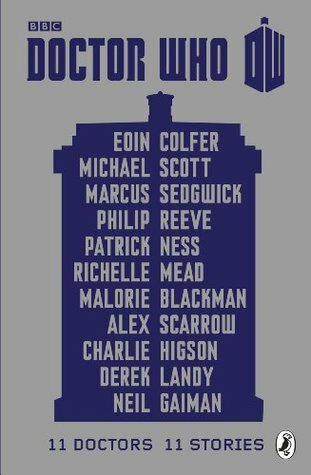 Doctor Who: Eleven Doctors, Eleven Stories by Eoin Colfer, Michael Scott, Marcus Sedgwick, Philip Reeve, Patrick Ness, Richelle Mead, Malorie Blackman, Alex Scarrow, Charlie Higson, Derek Landy & Neil Gaiman. 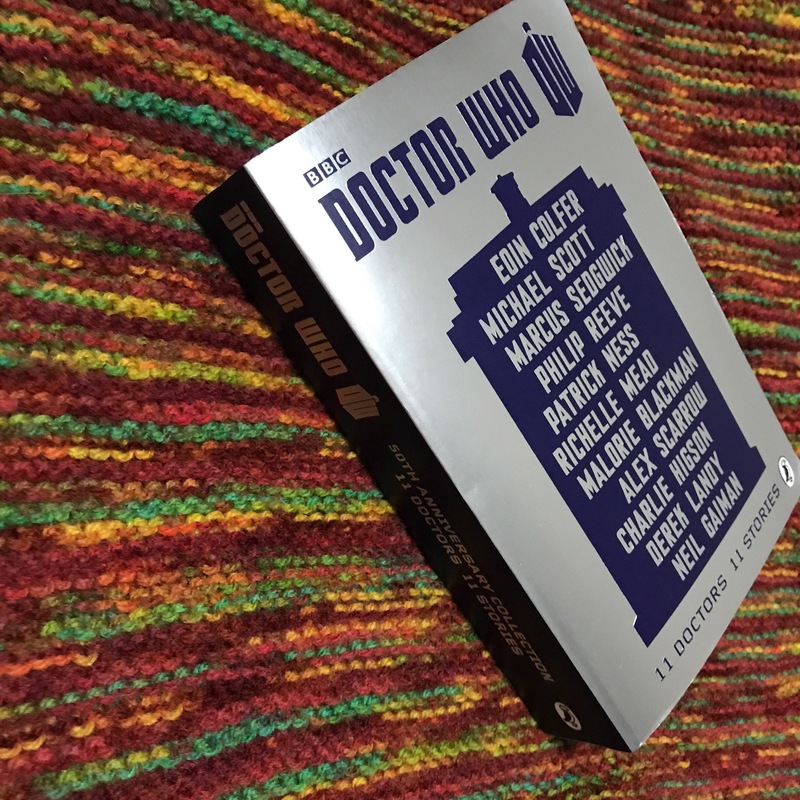 The Doctor Who 50th Anniversary Anthology is the perfect collection of adventures for Doctor Who fans.This print edition is the culmination of a year-long series of ebooks to celebrate fifty years of Doctor Who. Eleven Doctors, eleven stories, eleven unique interpretations of the Doctor, his terrifying alien enemies and his time-travelling adventures. A brilliant J.M. Barrie inspired adventure. Original old man Doctor and his granddaughter Susan, Children stealing Space Pirates, a fight scene on a London Rooftop and a big explosion to finish the bad guys off. 5/5 I Love, love, loved it Stars. The recorder playing doctor and his Kilt wearing Scottish companion captured by an army of glass apes with their makers, the Archon, trying to steal the TARDIS. A set of bagpipes the weapon that saves the day = awesomeness! 4/5 I really liked it Stars. Following the third Doctor and his companion Jo as they witness the origin’s of Norse mythology and foil The Master’s plans. The Norse myths were woven into this Doctor vs Master story wonderfully. 4/5 I really liked it Stars. The Scarf wearing Doctor’s future comes forward to haunt him in a story featuring a tree that’s waited nine hundred years for revenge and the humans that have adapted to living within its branches. 4/5 I really liked it. Pure Patrick Ness. The celery wearing Doctor and a boy named Jonny. Two separate yet interconnected stories. An enslaved alien race set free. It is amazing how much depth Ness crammed into a short story. 4/5 I really liked it. This story follows the Doctor and his companion Peri as they go to a world where everything resembles Las Vegas. They ruin a wedding and The Doctor and The Rani (a female time lord) face off. 2.5/5 I sort of liked it. It just didn’t hook me or wow me, but I think that was more the mood I was in reading it, rather than the story itself. Following the Doctor and his companion Ace while they rush to explore a collapsing alternate universe where the Daleks are a nurturing, peaceful race and Skaro is the universal hub of premium education. 4/5 I really liked it. The one-hit-wonder-movie-time Doctor comes across a spore that threatens to wipe out all life on earth. He bamboozles the US military into letting him take over, then saves everybody and everything. 4/5 I really liked it. This story is set between the spot at the end of the first Ninth Doctor episode when Rose turns the Doctor down and the TARDIS wheezes out then comes seemly right back. During what was a mere second or two for Rose, this story is what the Doctor go up to. The doctor’s companion for this trip is Ali, a young female who also happens to be a super warrior and a rather large crustacean. Together they set out to defeat two out of control stars’. Up until this point in the anthology all the Doctor’s companions had been human (ignoring Susan because no one can decide if she was gallifreyan or an adopted human). I really enjoyed the freshness of Ali’s differences. 5/5 I loved it. My Doctor and Martha collide with a being that creates illusions to trick you based on the fictional stories in your head, while feeding off the energy you create while your belief is suspended. 4/5 I really liked it Stars. The Doctor and Amy Pond, obviously quite early in their time together as Rory hasn’t joined them yet, come across a long-forgotten foe of the time lords who causes the extinction of humans. 4/5 I really liked it Stars.